CCG-190RB Color: Red/Black Features: -Durable enamel-coated firebox. 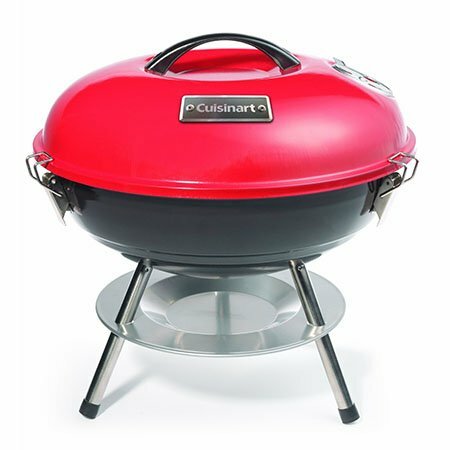 -Portable charcoal grill for on-the-go grilling. -Dual venting system for charcoal management and temperature control. -Convenient mess-free ash catcher. -Three secure lid-locks for safe and easy transport. -Wire cooking grate finish: Chrome-plated. Product Type: -Charcoal grill. Installation Location: -Portable. Material: -Metal. Fuel Type: -Charcoal. Dimensions: Overall Height - Top to Bottom: -15.2". Overall Width - Side to Side: -14.5". Overall Depth - Front to Back: -14.5". Overall Product Weight: -5 lbs.